Ben Miller and Anita MacDonald will be making their first appearance at Caltech in Beckman Institute Auditorium (Little Beckman.) They have been playing together for about four years, blending the rich traditional sound of the Cape Breton fiddle, with the fiery edge of the Scottish Border pipes. 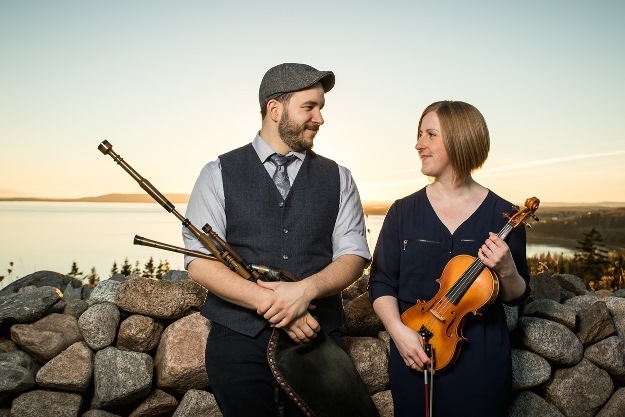 Combining their creative vision with influences from Old and New World Gaelic traditions, they create a powerful sound, heralded as “one of the most important folk acts on the Island [Cape Breton] today.” (Wendy Bergfeldt-Munro, Producer/Host CBC). Tempering the sharp edge of the pipes and fiddle, Ben and Anita will be joined by an acoustic guitarist and they will share thesound that has captivated audiences across North America and beyond. A cocktail of tradition, distilled like a pure drop of the Canadian Maritimes, their unique blend of driving dance music transcends boundaries – equally at home at a kitchen ceilidh or on a late night festival stage. “… Fiery, fresh, yet totally traditional.” (Alex Monaghan, Piping Today Magazine). Ben and Anita will definitely get your feet moving! Tickets are $20 for adults and $5 for children. You can buy them after Thursday, March 28 by calling the Caltech Ticket Office at (626) 395-4652. You can buy tickets online by clicking on the button below (there is a fee) and you can also buy them at the door on the night of the show.